The plant pathogenic fungus R. solani has a wide range of hosts and is one of the most serious fungal pathogens in the world. Fungal isolates were assigned to incompatibility groups based on their affinities for hyphal fusion with members of designated anastomosis groups (AGs). Japanese isolates were divided into ten AGs (Anderson 1982; Ogoshi 1987; Carling et al. 2002). Of these, AG1, AG2-1, AG2-2, AG3, and AG4 correspond to sasakii type (IA) and web-blight type (IB), winter crop type (II), rush type (IIIB), root rot type (IV) and potato type (IV), and praticola type (IIIA), respectively, based on their pathogenicity to field crops and growth characteristics in culture (Watanabe and Matsuda 1966). A survey of 114 isolates of R. solani from a wide range of plant hosts revealed that 48 isolates contained one to three plasmids, ranging in size from 2.2 to 7.0 kb (Hashiba et al. 1984, 1987a, 1987b; Shimma et al. 1988; Miyasaka et al. 1990; Chen et al. 1992). We examined the sequence homology among DNA plasmids in representative isolates using Southern blot analysis with nick-translated DNA plasmids as probes (Miyasaka et al. 1990; Hashiba et al. 2001; Chen et al. 1992). Considerable sequence homology was detected among DNA plasmids obtained from isolates within the same AG, but no relationship was detected among DNA plasmids obtained from isolates belonging to different AGs, emphasizing the fact that AGs are genetically distinct (Table 1). Jabaji-Hare et al. (1994) examined 54 isolates from five AGs in Canada, and found a 2.4-kb plasmid (pRS104) in AG4 isolates and a 3.6-kb plasmid (pRS188) in AG5 isolates. DNA plasmids in R. solani were identified by Rubio et al. (1996). They surveyed 15 AG4 isolates, 13 from Spain and two from Israel; 13 of these isolates contained a 2.6-kb DNA plasmid (pMe8-2). As expected, there was no sequence homology between the pMe8-2 plasmid (AG4, Spain) and the pRS188 plasmid (AG5, Canada). These findings are consistent with the results obtained with Japanese isolates by Miyasaka et al. (1990). AGs and intraspecific groups (ISGs) of R. solani and might be used to classify this fungus. The relationship between the DNA plasmids and AGs or ISGs is consistent with the results of DNA base sequence homology (Kuninaga and Yokosawa 1985), serologic comparison (Adams and Butler 1979), DNA base comparison (Kuninag and Yokosawa 1980), ecologic and morphologic characteristics (Ogoshi 1976), and electrophoresis of isoenzymes (Matsuyama et al. 1987) and soluble proteins (Reynolds et al. 1983). Thus, these DNA plas-mids are host-specific. Isolates of F. oxysporum that cause disease in crucifers are categorized based on their relative ability to cause disease in a particular host species. Isolates causing the cabbage yellows disease, sweet potato stem rot disease, flax wilt disease, and the edible burdock wilt disease are defined as F oxysporum for-mae speciales (f.sp.) conglutinans (Snyder and Hansen 1940), f.sp. lini, and f.sp. arctii, respectively, while isolates pathogenic to the radish, ornamental crucifer stock, and eggplant are called F. oxysporum f.sp. raphani, f.sp. matthi-oli, and f.sp. melongenae, respectively (Bosland and William 1987; Kendrick and Snyder 1942). Three 1.9-kb DNA plasmids designated pFOXCl, pFOXC2, and pFOXC3, are found in F. oxysporum f.sp. conglutinans, f.sp. raphani, and f.sp. matthi-oli, respectively (Kistler et al. 1987; Kistler and Leong 1986). The plasmids have different restriction fragment length polymorphism maps, and while pFOXC2 and pFOXC3 cross-hybridize, Southern hybridization analyses suggest that pFOXC1 and pFOXC2 have no sequence similarity (Kistler et al. 1987; Kistler and Leong 1986). A survey of 61 field isolates of F oxysporum from Japan revealed six linear plasmids (Hirota et al. 1992). All examined isolates of F oxysporum f.sp. arctii, f.sp. batatas, f.sp. conglutinans, f.sp. lini, f.sp. melongenae, and f.sp. raphani contain mitochondrial plasmids, termed pFOA, pFOB, pFOC, pFOL, pFOM, and pFOR, respectively (Hirota et al. 1992). pFOC, pFOL, and pFOA have considerable sequence homology among each other, but pFOR, pFOM, and pFOB have no sequence similarity. Both pFOC and pFOXC1 obtained from f.sp. conglutinans have essentially the same restriction endonuclease map, and both pFOR and pFOXC2 obtained from f.sp. raphani had sequence similarity (Fig. 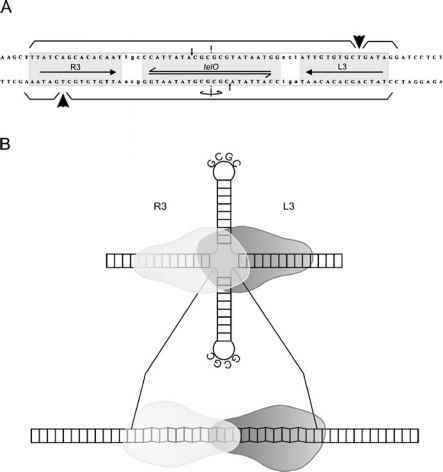 1) (Kistler and Leong 1986; Kistler et al. 1987; Hirota et al. 1992).